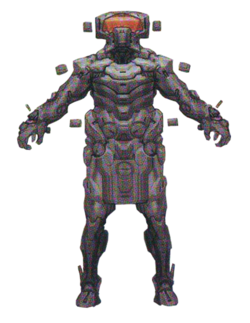 Miner forms were shorter and stockier than the other Forerunner rates. "Miners are rated below Builders, but they are sensible, proud and strong. Miners know the raw, inner ways of worlds. Respect them, and they will treat you well, teach you what they know, and return you to your family with all the discipline and skills a Manipular needs to advance." Miners were a rate in Forerunner society, ranking below Builders but above Lifeworkers. Their duties involved planetary and stellar engineering, and by extension the acquisition of resources for the ecumene, including the Builders' plentiful construction projects. The Miner installation X50 disintegrating Draetheus V.
Miners were generally seen as tough and pragmatic, and their manner of speaking was characteristically direct, lacking the tact most of the other rates were used to. Miners were most comfortable when on a planet or working with planetary material. The Miners were responsible for the artificial formation or destruction of planets and the manipulation of stars, usually to harness them for energy collection. Miner stellar engineers were colloquially known as plasma jockeys. Their planetary engineers were capable of creating planets by melting down an asteroid field and shaping the resulting mass into a protoplanet which could be fully cooled in under 10,000 years. They would also occasionally destroy entire planets to gain access to the resources within. X50, a satellite of Draetheus V, was an example of a Miner installation used in planetary engineering. The artificial moon was equipped with an energy beam capable of dismantling its parent planet within hours, although Miners are suggested to have been capable of even more energetic planetary destruction. For more local mining operations, Miners used mining ships which could rapidly excavate large masses of minerals and ore by using powerful energy fields. During the height of the Forerunner civilization, Miners had activity in the Sol system, specifically Mars, then known as Edom. After disobeying his father, Bornstellar Makes Eternal Lasting, a Manipular from a wealthy Builder family, was sent to work with a Miner family inhabiting Edom. Clearance-of-Old-Forests - member of the crew of Audacity during the journey to Path Kethona. A Miner who assumed the carapace of Catalog after expediting a planet's violent destruction, murdering his crèche-mate, along with twelve other Miners, out of jealousy. ↑ Halo Mythos, page ? ?